Ford wins a major environmental award for its new technology that makes engines more efficient and uses some hybrid technology, such as auto-start-stop and braking regen energy without the cost of a true hybrid electric. Ford has received a prestigious EcoGlobe award in recognition of its achievements in introducing environmentally-advanced, yet affordable technical solutions under the Ford ECOnetic Technologies programme. The award – one of ten presented annually by an independent jury for what they consider are outstanding environmentally-friendly vehicle solutions – was presented to the Ford Fiesta ECOnetic as a representative model from the Ford ECOnetic Technologies range. 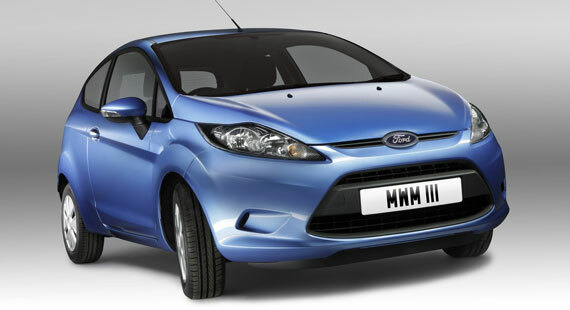 With CO2 emissions of just 98 g/km, the Fiesta ECOnetic is one of Europe’s most fuel efficient, low CO2 passenger cars. Ford EcoBoost – all-new petrol engines featuring turbocharging and direct injection technology to provide the performance of a larger displacement engine with the fuel economy and CO2 benefits of a smaller unit. Ford Duratorq TDCi – a range of high-efficiency common-rail diesel engines which have been further improved to deliver even better fuel economy and lower CO2. Ford PowerShift transmission – an advanced dual-clutch design, combining the efficiency, optimised gear ratios and driving enjoyment of a manual gearbox with the smoothness and ease-of-use of a conventional automatic. Ford Auto-Start-Stop – automatically cuts the engine when at a standstill and restarts it as required by the driver to avoid unnecessary fuel use. Smart Regenerative Charging (SRC) – creates electrical energy from braking movements to enhance existing power sources. Active Grille Shutter – variable grille opening which reduces when the vehicle is at speed to improve air flow efficiency and lower fuel consumption. Ford ECO Mode – an driver information system that helps educate the driver to achieve improved real-world fuel economy. Electric Power Assist Steering (EPAS) – a more efficient steering system which reduces the drain on power reserves and thereby supports more efficient operation. Gear Shift Indicator – advises the driver of the most efficient point for gear changes. In addition to ECOnetic Technologies, Ford also continues to offer dedicated ultra-low emission ECOnetic models, including the EcoGlobe-winning Fiesta, the Focus, Mondeo and Transit. These Ford fuel economy hero vehicles feature unique technologies including longer gearing, specific engine calibrations, special aerodynamic packages, and ultra-low rolling resistance tires, in different combinations according to model. Longer term, Ford ECOnetic Technologies will expand to include a range of other hi-tech features under development, including further weight reduction and aerodynamic improvements, electric, hybrid and plug-in hybrid electric vehicles, biofuel-capable vehicles, and hydrogen-powered vehicles. “Ford is committed to achieving class-leading fuel economy and CO2 levels through affordable technological innovation, yet without compromising design or driving fun,” said Wolfgang Schneider, Vice President Legal, Governmental and Environmental Affairs, Ford of Europe. EcoGlobe was founded by a consortium comprised of the DEVK insurance company based in Cologne; the German automobile club, ACV; the Öko-Globe Institute of the University of Duisburg; and the environmental artist HA Schult.